Among the most unusual and exotic of big mammals that I’ve seen in captivity is the Babirusa: as discussed in a previous post (How big is a white rhino? ), Marwell Zoo has a few individuals, and one of these at least is an apparently friendly individual who comes to greet you as you approach his enclosure (see photo below). What with my several recent blog posts about peccaries (go here and here), I thought I might continue the suiform theme, and in between doing other things I’ve been reading a lot about babirusas lately. What have I been doing lately you ask? That would be telling, but recent adventures have involved a buzzard skull, sika deer, those green lizards again (go here for background) and Megamuntiacus. In fact expect a lot on deer here in future. I’m pretty much giving up on dinosaurs. Anyway, back to the babirusas. You might be surprised to learn that babirusas have been known to westerners for a comparatively long time, having been named Sus babyrussa by Linnaeus in 1758 (the generic name Babyrousa was first coined by Perry in 1811). In fact babirusas were first mentioned in the European literature as early as 1658, and there have even been claims that the Romans knew of babirusas in the 1st century AD. 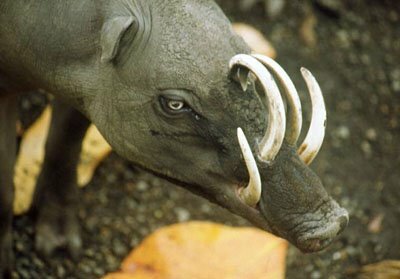 Linnaeus wrongly identified Borneo as the babirusa homeland, and over the following years other authors misidentified Sumatra, Amboina and elsewhere as the place where babirusas came from. Today we know that they are endemic to Sulawesi, the adjacent Togean (or Togian) Islands, the Sula Islands (just east of central Sulawesi) and Buru (south-east of the Sula Islands, and the most westerly of the Moluccas). What might also surprise you is that the babirusas found across these islands are not all alike, and in fact the sort of babirusas we are all familiar with – those with naked skin and upper canines that curve in a circle – are by no means representative of these animals as a whole. Historically, babirusas were probably present across the whole of Sulawesi, but by the 19th century they had disappeared from the south-western peninsula. As of 1990, they were still present on Buru and two of the Sulu Islands (Mangole and Taliabu), but have become extinct on others (Macdonald 1993). Thanks to logging, habitat destruction and illegal hunting, babirusas are under pressure across their range. Sula Island and Buru babirusas have often been regarded as introduced, and while this is likely (we know that Sulawesi people kept babirusas and traded them far and wide because of their remarkable appearance and good eating) these populations represent distinct taxa, the biogeographical origins of which remain obscure. It is also conceivable however that these colonisations occurred naturally, as babirusas are very strong swimmers and well able to make short sea journeys. On Sulawesi, babirusas have been observed swimming across the 10-km-wide Lake Poso (Melisch 1994). Adjacent photo from here. 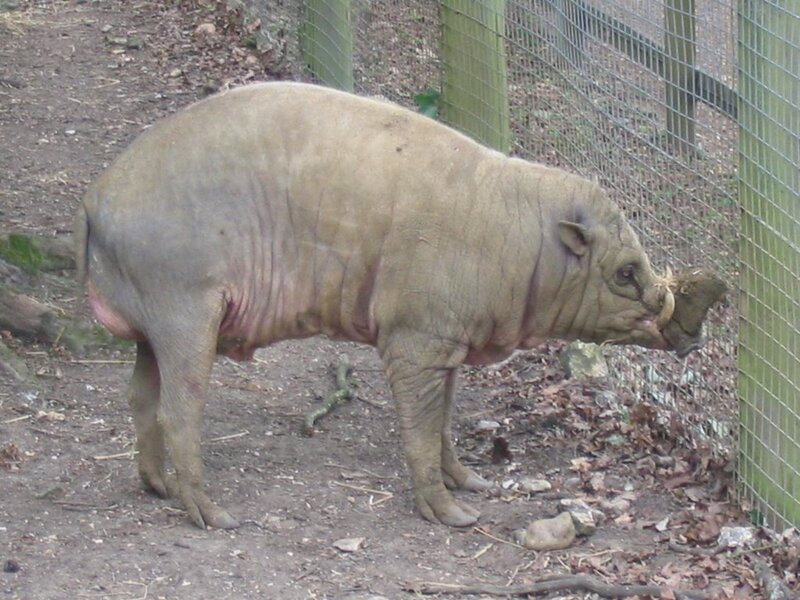 While babirusas look pig-like and are classified as part of Suidae, they are distinctive and unusual. Combining rather slender legs with a barrel-shaped body, they can exceed 1 m in length and have a shoulder height of c. 30 cm. Some individuals weigh as much as 100 kg. Babirusas are odd in having particularly remarkable canines (more about those in a minute), but less well known is that they differ from other pigs in several details of their anatomy, and in fact resemble peccaries and other artiodactyls in a few features. The tendons of their feet and some of their throat muscles are strikingly peccary-like, and they resemble ruminants (though only superficially) in a few details of their pectoral musculature, and in having a complex, multi-chambered stomach. Furthermore, the snout of babirusas is not as specialised as that of other pigs. In a curious parallel to this combination of anatomical features, the word babirusa combines babi, meaning pig, with rusa, meaning deer. It is supposed that Sulawesi people chose this name as the large canines of babirusas recall antlers, but it is also possible that the name reflects the amalgamation of deer-like slender legs and a multi-chambered stomach with the pig-like traits of the animal. Sulawesi people have always known of pigs other than babirusas, as Sulawesi is also home to the Sulawesi warty pig Sus celebensis*. Incidentally, you may recognise Rusa as the old generic name for the Sambar Cervus unicolor and other deer of Indonesia, the Philippines and adjacent islands. The Sunda sambar or Timor deer C. timorensis occurs on Sulawesi, but was probably introduced there from Java or Bali. * A large extinct Pleistocene suid, Celebochoerus heekereni, was also endemic to Sulawesi, but so far as we know was not related to either babirusas or Sus celebensis. In view of the divergent anatomy of babirusas, most artiodactyl specialists agree that they represent an ancient lineage, Babyrousinae, which branched off from the rest of Suidae early in its evolution (Thenius 1970). This is supported by chromosome data, as several autosomes present in babirusas have no equivalent in other suids. Unfortunately babirusa fossils only go back as far as the Pleistocene, but in theory we should expect to find babyrousines going back to the Oligocene. Is it possible that babirusas aren’t part of Suidae? Such a view was favoured by Deninger (1909) who argued that babirusas descended from anthracotheres like Merycopotamus. Anthracotheres, a widespread extinct group that appeared in the Eocene and survived into the Pleistocene in eastern Asia, are probably ancestral to hippos (and thus perhaps not close to suids at all), and while Deninger’s idea has been mostly dismissed it was viewed favourably by Groves (1981). He thought it at least possible that babirusas might really be extant anthracotheres, which is a pretty radical thought. For the record, no, this has not been accepted and babirusas are universally regarded as suids. Despite the ancient divergence of babyrousines from other suids, a male babirusa recently hybridised with a female domestic pig at Copenhagen Zoo (this was announced in the news last week). Of the five resulting piglets, one has died but the others are apparently ok. While the successful mating has surprised some biologists, we should remember that successful hybridisation can occur between species that are only distantly related, so it actually doesn’t mean much. 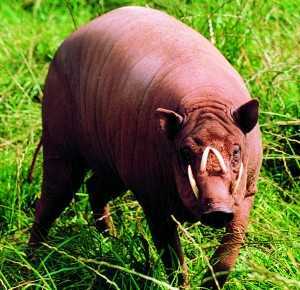 Like many (but not all) pigs, babirusas are omnivorous, and are said to eat invertebrates whenever they find them. They have also been reported to eat fish on occasion, to catch small mammals, and even to catch and eat the juveniles of other babirusas (Leus & Morgan 1995). They eat all kinds of plant material, including fruits, leaves, flowers, berries, nuts, bark and tubers, and they not only browse and dig to obtain such items, they are also surprisingly good at standing bipedally (without support) to feed on leaves. This again is a curious parallel with deer, in particular Sambar. So what’s with the bizarre curving tusks? Present only in males (females lack canines entirely), they grow continuously throughout life, and their growth, anatomy and function are all odd. The lower canine is normal in position and anatomy, it’s just that it becomes particularly long during growth, overlapping the outside edge of the snout as it grows. The upper canine is another story. Initially growing downwards – like any normal mammalian upper canine – it is then rotated as the alveolus itself turns to force the tooth upwards, and it eventually emerges from the dorsal surface of the snout. The most anterior part of the spiral parallels the long lower canines. As mentioned earlier, we are mostly familiar with those babirusas where the upper canines curl in a circle as they grow, forming a spiral over the animal’s forehead. As we’ll see in the next post, spiralling upper canines of this sort are not present in all kinds of babirusas. Regardless, in those babirusas with spiralling tusks, some authors say that, if the animal lives long enough, the tusks grow fatally into the face (Irven 1996). However, in the old male skulls that I’ve seen (see accompanying images: the woodcut is from Alfred Russel Wallace’s 1869 The Malay Archipelago), the tips of the upper canines begin the anterodorsal part of their curvature a short distance dorsal to the upper surface of the skull, so if they were to continue to grow they would harmlessly curl upwards. 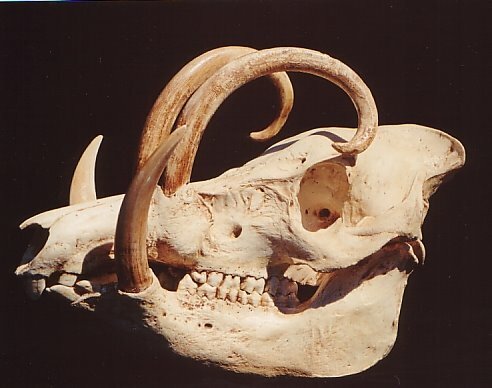 Furthermore, so far as I can tell from the literature, no-one has ever found a babirusa skull in which the upper canines have bored into the bone. A Balinese demon with curling tusks that emerge from its cheeks – the Raksasa – might have been inspired by stories or sightings of babirusas (Groves 1980). Famously, people on Celebes once supposed that babirusas hung from trees with their tusks, and stay there in wait for passing females. This seems to be the one ‘fact’ about babirusas that everyone knows, as it’s mentioned in just about every article, paper and book that discusses them. It’s often stated that the tusks might be used in display or fighting, but there is also the old idea that the tusks allow males to push their way through dense stands of ratten cane, thereby allowing tusk-less females and juveniles to follow in single file behind. Well, maybe the tusks can be used in this way, but they can’t of course have evolved for this purpose given that the intermediate stages leading up to this ‘end’ condition wouldn’t have been at all useful. More on tusks in the next post. Perhaps surprisingly in view of their sensitivity to cold, babirusas have fared quite well in zoological collections, having first been kept in Europe at ‘la Ménagerie du Roi’ in Paris during the 1840s, and having bred at London Zoological Garden as early as 1884. In 1995, 29 zoos worldwide held babirusas. Several individuals have survived in captivity for more than 20 years, with the record holder being an animal kept at Chicago which, on its death in 1920, was 21 years and 4 months old. Paul Irven (1996) wrote that captive babirusas are ‘sensitive and responsive … with an endearing character’. They are also said to exhibit excitement and enthusiasm on greeting familiar people, engaging in tail wagging, head shaking and jumping and running about. This friendly disposition makes them quite different from many other non-domesticated suids. And that’s that for now: more on babirusas in the next post. Coming soon: Up-close and personal with Red deer, Why Draco volans is boring, Temnospondyls for beginners, Kinglets and the passerine supertree, Fake Chinese turtles, Steep Holm and the biggest slow-worm ever, Naish’s guide to Rhinogradentia, Really flying lemurs, The habits of storks, The probing guild, Recently extinct island-dwelling crocodilians and Our lost tree frogs. And for the latest news on Tetrapod Zoology do go here. Deninger, K. 1909. Über Babirusa. Ber. Naturf. Ges. Freiburg 17, 179-200. - . 1981. Ancestors for the Pigs: Taxonomy and Phylogeny of the Genus Sus. Technical Bulletin 3, Department of Prehistory, Research School Pacific Studies, Australian National University. Melisch, R. 1994. Observation of swimming babirusa in Lake Poso, central Sulawesi, Indonesia. Malayan Nature Journal 47, 431-432. Thenius, E. 1970. Zur Evolution und Verbreitungsgeschicht der Suidae (Artiodactyla, Mammalia). Zeitschrift für Säugetierkunde 35, 321-342. Furthermore, so far as I can tell from the literature, no-one has ever found a babirusa skull in which the upper canines have bored into the bone. 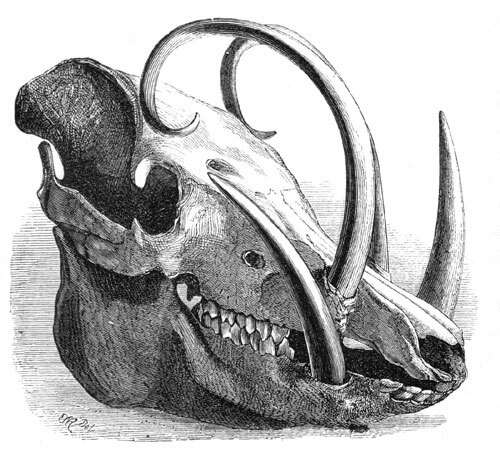 I swear that I have seen a babirusa skull in which one of the canines cut into and back out of the frontal, just anterodorsal to the orbit. The puncture was very shallow, and I don't think it penetrated the braincase at all (for one thing, it was too far forward). I'm reasonably certain that it was in the National Museum of Natural History in D.C. If it wasn't the NMNH, it might have been the Field Museum or the Carnegie. I don't have a photo, so I can't prove it. Darren-- can you give us some other examples of "not closely related" hybrids? In birds, I know of a cross- genus hybrid in captivity: Harris' hawk (Parabuteo unicinctus) X Cooper's hawk (Accipiter cooperi). I believe there are also cross- genus pheasant hybrids, though whether pheasants are as divergent as Buteonine hawks and Accipiters I haven't a clue. A herpetologist (James Lazell) used to say that bird genera were far too finely divided (ie he would lump them much more). Comments? By the way, Lynn Clayton has a blog Babirusa.Org on her effort to save these animals. -- The Australian scincids Egernia and Tiliqua, which have been separated for over 20 million years (as demonstrated by fossils) can still hybridise. -- Among pinnipeds, sealions belonging to Arctocephalus and Zalophus often hybridise, but they are well apart in phylogenies, and have traditionally even been grouped in separate subfamilies. -- Among phocid pinnipeds, Phoca and Cystophora have been reported to hybridise, but again are from different 'subfamilies'. -- Also on marine mammals, the distinct monodontids Delphinapterus and Monodon have hybridised in the wild, as have the delphinids Tursiops and Grampus. In captivity, Lagenorhynchus has crossed with Tursiops, as has Pseudorca. All of the genera here are not particularly closely related. -- As is well known, intergeneric hybrids have been widely reported among felids. Pretty much anything goes, even across highly disparate lineages. The bottom line seems to be that hybridisation is actually far more normal than we tend to think, but that multiple genetic 'preventative mechanisms' have evolved among numerous lineages. My feeling is that behaviour and ecology stops hybridisation occuring as much as it otherwise might: among us hominids for example, there are reasons for thinking that chimps and gorillas can hybridise, and even that humans can hybridise with chimps. I might elaborate on this another time, and no I haven't been smoking crack. I'll look forward to that. I've got Stumke's book on the shelf right above the monitor. I had heard of cats and the Hominids don't surprise me, but I'm with Moro-- and I'd like to see the Tursiops crosses too! Ok, I'll have to produce a post on hybrid cetaceans some time in the future! The beluga-narwhal hybrids - informally dubbed 'beluwhals' - were odd (for info see the refs below). If I remember correctly, there were three individuals: one was killed by an inuit and its skull was retained, while the total appearance of the animals was reconstructed from the hunter's recollection. The idea that the animals were hybrids is actually a hypothesis, and there's the slim and unlikely possibility that they actually represented a hitherto unknown, new monodontid taxon. Among delphinds, I've never seen the Grampus - Tursiops hybrids figured anywhere, but lag-bottlenose and false killer-bottlenose hybrids have been well figured in books, popular articles and postcards (Richard Ellis figures a lag-bottlenose hybrid in his 1989 Dolphins and Porpoises). A false killer-bottlenose hybrid called Kekaimalu is kept at Sea Life Park Hawaii, Honalulu. She has been nick-named a 'wolphin' (as in 'whale dolphin'): do a google search for that word and you'll get a million hits. In fact Kekaimalu gave birth herself to a baby sired by a bottlenose father. The baby was named Kawili Kai and was born in April 2005. Heide-Jørgensen, M. P. & Reeves, R. R. 1993. Description of an anomalous monodontid skull from west Greenland: a possible hybrid. Marine Mammal Science 9, 258-268. Redmond, I. 1993. Beluwhals break out. BBC Wildlife 11 (11), 12. I don't think the teeth would necessarily perforate the skull, though. More likely it will make enough damage before reaching this point, by harming the skin itself, and maybe the teeth's roots are more fragile than the skull, so the "impact" is absorbed there, I don't know. That would not likely be nice either, however. It seems it may also sometimes tear the animal's eyes. But maybe the animal is smart enough to break it against some tree if it starts to hurt. I don't know. Only as tall as a housecat? Going by the photo Mark Witton uploaded to flickr, I'd guess at least 0.75 m.
You're dead right; I have no idea where 30 cm came from. Walker's Mammals of the World gives the shoulder height as 65-80 cm.